*This week my friends are sharing their wonderful trip to Tulum, Mexico! Kendra and Lauren went to Tulum this past February, and they are very generously sharing it with The Constant Wayfarer. Anyone want to go to Tulum? Canopia [raw, vegan, paleo, and GF friendly, wifi -$] - We stumbled upon Canopia our first morning in Tulum. With little wooden tables and an outdoor kitchen nestled in amongst large tropical trees, flowers and hanging globe lamps the vibe told us we shouldn’t pass this place up. We snatched a parking spot (so it had to be destiny! ), and as soon as we read the menu we knew this place was a gem. The menu was diverse and offered fresh organic dishes, smoothies and juices that catered to practically any food preference. As someone who struggles with many food allergies and a somewhat limited diet I was a bit worried about finding such options in Tulum. But this place really blew us away. It’s technically a Thai restaurant, but in the morning, the options are incredible. We filled our bellies with the most delicious organic pour over coffee with organic almond milk, a chia pudding bowl made with fresh coconut milk and filled high with fresh picked tropical fruit, an additional fruit plate (a must), fresh eggs and toast with avocados and micro greens salad. We loved everything we tried and knew we would without a doubt visit again before leaving. Sure enough, we made a stop back by Canopia on our last morning in Tulum. We needed a healthy and lasting breakfast to take us through our travels home. We ordered an ambitious portion this trip with a few rounds of coffee, eggs benedict that was rich and perfectly satisfying, we also had a twist on huevos rancheros with freshly toasted corn tortillas, ham and peas. The service was impeccable everywhere we went and Canopia was no exception. Our waiter talked us up about what we loved most about Tulum and offered to take our picture so we could remember our last morning in paradise. He was sweetly honored that we chose their restaurant for a second time and made us feel like the queens we are. I still think about this delicious food months later with a mouth watering craving for its spot on fresh flavor. We cancelled the reservation and looked for anywhere to eat with parking. Zamas is a hotel, but the restaurant actually has it’s own parking lot across the street. (MIRACLE!). The view is breathtaking. Even walking in, you follow a path lit with giant moon lanterns. You can hear the ocean as you walk up, and then are met with a gorgeous view of the beach. The patio overlooks the water crashing over rocks (you can even go and climb them afterwards). The food was wonderful. Everything is fresh and local. The drinks are amazing (our first intro to Coco-Locos). We were able to work around food allergies there too. Tacos, fantastic burgers, potent drinks. But the best thing is their breakfast. Lots of fresh fruit, amazing coffee...even pancakes. They serve their coffee with a coconut cream that is so good. We went a few times (even once for 2nd breakfast). Zamas was our last stop before going home, after our final Canopia breakfast, to get one last view of the beach. It wrapped up the trip beautifully. Mateos [Vegan shakes, paleo and gf friendly, wifi, $]- A friend had recommended Mateos, insisting we go, but we just kept putting it off. We’ve never regretted anything more. We went one of our last days for a quick lunch and realized it’s amazing. The word that comes to mind when I think of Mateos is...red. Like most restaurants in Tulum, the majority of the seating is outdoor. They have fabric coverings overhead to make shaded areas...and that fabric is very red. At night, all of the lights are red. The place glows red, even inside. It’s really cool. We came back our last night for final tacos and drinks. That’s when we realized that Mateos is actually a treehouse. It feels like Swiss Family Robinson, going up the stairs and over walkways to different seating areas. We ate downstairs and were greeted with an amazing local cover band. It was loud and a perfect last night in my new favorite vacation spot. Hartwood [Mexican, Seafood, GF friendly, $$$]- The day I booked my flight, I emailed Hartwood for a reservation. I had only heard the most amazing things about this place. We made this our “dress-up night” and we were looking forward to it all week. It was hard to know what to expect since their menu changes daily. We arrived, parking just down the street in a paid lot, and were seated almost immediately. Everything is outdoors, lit by torches and candle light. It’s so lovely! Our server brought a large chalkboard menu to our table and explained each item, answering questions and helping us make the best possible choice. The food was insane. This was the best meal of the trip. We ate slowly, trying to soak up the atmosphere and the food, stretching out our visit as long as possible. There was a large group waiting to be seated, many of them had gotten there before us. That’s why a reservation here is key! Some of them had yet to be seated when we left. This was our most expensive meal. They have an ATM on site, so we were able to grab more pesos to cover it. But it was worth it! 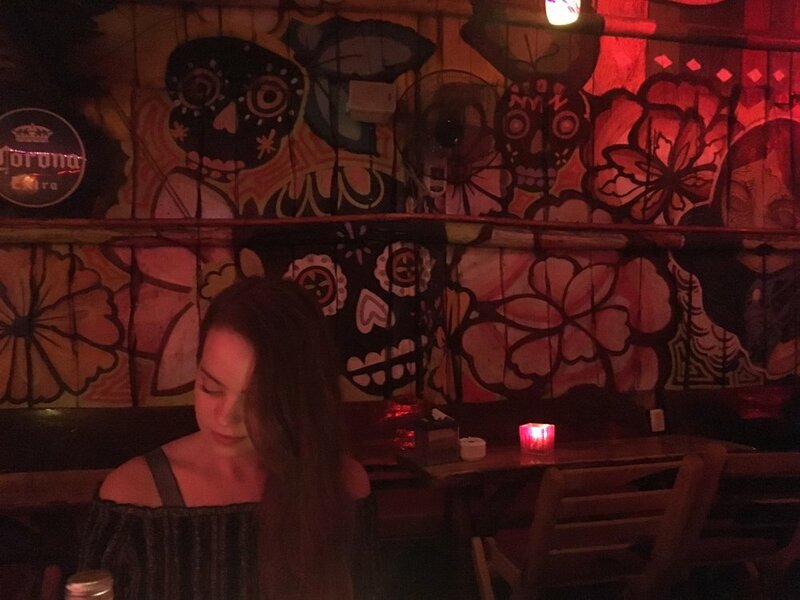 Taquiera La Eufemia [tacos, margaritas, wifi, CHEAP -$]- This was such a weird, fun little place. It was a short walk on the beach (you can’t access it from the street. Or if you can, it’s some magic portal we never discovered.) We saw people sitting on little beach beds which was a little confusing at first (do we seat ourselves? What are these bed things? Do we need to find a waiter?) but we were quickly helped and sat at table right on the sand, with an unobstructed view of the water. The menu was simple, and the tacos were perfect. The margaritas were strong and cheap, so you can’t really go wrong there. Mid-way through dinner, the music amped up and all the lights coming from the building turned blue, making everything trippy and glowy. We giggled at the fun vibe, sipping our incredible drinks. One of the best thing about Tulum is how kind and accommodating everyone is to tourists. This place was just one of the many examples. I saw they had a milkshake on the menu and thought it would be awesome to get one to go, to drink walking back down the beach for some late night stargazing. They seemed confused by the request, but immediately told me it was no problem. Moments later they came back with a glass of chocolate (coconut) milk on ice. An actual glass. They insisted I take it with me. So moments later I was walking down the beach, with a glass of chocolate milk in my hand. Not quite what I was looking for, but delicious. Juice bar [fast, freshly made, vegan friendly-$]- A sweet little roadside pit spot perfect for a morning walk or a hot afternoon quencher. The freshly prepared juices are deeply nourishing and the perfect little pick-me-up. We decided to try a decadent blend made from fresh coconut milk, cacao, espresso and maca. It was heavenly and perfect for satisfying a sweet tooth. We also got to sample their spicy green juice blend and a tart and tangy tangerine juice, both of which were flavorful and delicious. The 2 ladies that run the shop switch up the juices they sell based on what is local and ripe, so expect a different offering each visit. But there is no doubt you will find a healthy and tasty treat here. Casa Banana [upscale, dinner, Argentinian, wifi- $$$]- We’ve written about the good. Now the...meh. We went to Casa Banana our first night. We had just gotten in and settled and were trying to get our bearings. We walked down the street to look for somewhere to eat, still not fully grasping the currency, what places accepted cards, American dollars and what not. We were hungry and tired and stopped in Casa Banana. It was close and the menu looked ok. The good is that the drinks are AMAZING. Like, for one they put in a burning stick of cinnamon in the drink. It’s a beautiful place. We were in awe of it when we went in (but technically out. Most of these places are strictly outdoor seating.) And the best thing...they accept PayPal if you don’t have pesos. Which was really handy for the first night when I accidentally withdrew 100 American dollars from an ATM, which they did not take. The bad...super overpriced. The food is very good. But it’s New York expensive in a town where you can eat an incredible meal for two for under $30 almost everywhere else. And we had some menu issues. Lauren has some food allergies. Those were communicated to our server but the meal had to be sent back a couple of times. They were very kind and made something new, which takes a while. But there was no adjustment to the price, or anything like that. It was frustrating to have to wait and the food still had some issues. It was good in the end. But no worth what we paid, even if it had come out perfect. That was our only food regret. *Have you ever been to Tulum? Would love to hear if you enjoyed it and any tips you learned along the way?